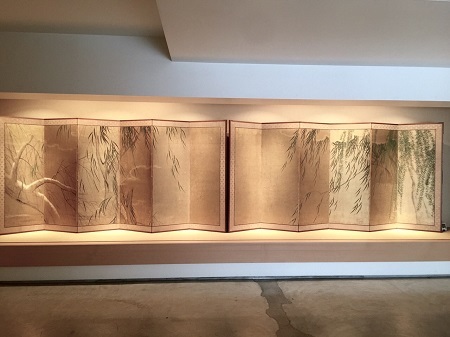 We hope this finds you well as spring slowly begins, and we hope too that you will take the time to come see our latest exhibition, where you will be welcomed by the screens Willows of the Four Seasons, by Hasegawa Tōhaku (1539 - 1610). This painting is a very simple composition, including only four willow trees and a brushwood fence against a ground of gold leaf. Read from right to left, the work begins with a tree sprouting the fresh new leaves of spring, followed by another tree with fuller branches blowing in the winds of summer. In the left screen we next encounter autumn, when leaves begin to fall away, and end with the nearly bare branches of a willow in winter, with snow upon its trunk. Feeling the seasons change as the winds of time blow through the wispy branches of the willows here, one could never grow tired of admiring these screens. With the scent of plum blossoms in the air, we hope you will take the time to come visit us soon.